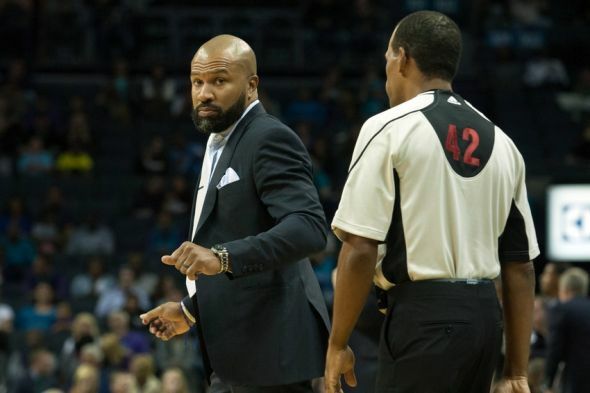 Before February 8, 2016, four NBA head coaches have already lost their jobs at the helm; now that number has been increased to five with the addition of Derek Fisher. Phil Jackson fired his former player from his gig as coach of the struggling New York Knicks. When Phil Jackson came aboard, he hired Fisher with the hopes that he would teach the Knick players the way of the triangle offense; being that he was a point guard for Jackson spanning over nine seasons. However, the New York Knicks are doing worse than they were prior to hiring Fisher to replace Mike Woodson in the 2014-2015 season. The Knicks have always been a dysfunctional organization for several different reasons. They have a front office lead by one of the most hated men in sports, they are trying to execute a system that doesn’t fit their players, they are void of first round draft picks to acquire younger players, and the player that they gave an extension to over the summer of 2014 hinders them from actually making any forward progress. The firing of Fisher just adds on to the known flawed organization that is run in New York. The failure of the Knicks thus far isn’t on Derek Fisher himself, he is being used as a scapegoat by Phil Jackson and the front office. The Knicks organization gave Fisher a team that isn’t very gifted on offense nor defense, and expected him to coach the team to a winning record. The Knicks have no depth and a lack of offensive production past Carmelo Anthony, Kristaps Porzingis, and Arron Afflalo. Fisher shouldn’t have to take full responsibility of the disappointment that this Knick season has been. Porzingis continues to make noise but besides his exciting play since being drafted, the Knicks don’t have another player to develop. Anthony will continue being the offensive stopper that he has been for his whole career, so there’s no hope in changing that at this point. Don’t be fooled by his career high 4.2 apg this season, he is still very capable of constant isos and inefficient jumpers. Hopefully, Phil Jackson has some sort of plan in place to revive the New York Knicks and release them from their three season playoff drought. Firing his head coach wouldn’t be the first step in that direction for the sake of continuity, but if he has a better option lined up then maybe the decision was for the best. The current pool of fired head coaches does not lack experience at the position. This season, the NBA has seen Kevin McHale get fired by the Rockets, Jeff Hornacek get fired by the Phoenix Suns, David Blatt get fired by the Cleveland Cavaliers, and Lionel Hollins get fired by the Brooklyn Nets. Of all four of these coaches, only Jeff Hornacek hasn’t made the playoffs. In addition to these contenders, Jackson can also choose from defensive savvy Tom Thibodeau, the inspiring Mark Jackson, or assistants just waiting for that career-altering phone call. There’s also the option of going with another one of his former players, which may actually be his best bet at this point. Luke Walton or Brian Shaw should be Jackson’s next hire at the coaching position in New York. Granted, neither has been a head coach for a long period of time. Walton has only been an assistant prior to being interim coach of the Warriors for half the season, while Shaw has only been at the position for a season and a half with the Denver Nuggets. However, if Jackson desires that the team runs this system that not many coaches know how to run, then he’s going to have to slightly lower his standards. Additionally, once he makes the hire he can’t turn around and fire them at the first sign of trouble. He needs to be patient and realize that the team he signed to be President of is not all that good right now. Steph seemed to enjoy his time with Walton as his coach, and although Shaw’s track record with players isn’t the best; he does deserve another opportunity as head coach to prove that he’s capable.